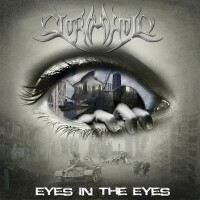 STORMHOLD is a Melodic Death Metal band from Belarus. The band was formed in 2003 and has so far three releases up its sleeves: “2050” (a demo from 2004), “Negative Infinity” (demo album, 2006), and most recently the EP “Eyes In The Eyes”, which was released in April 2013. The band is currently unsigned, and is working on their second full-length. This will be titled “The Lost World” and will contain new songs as well as the three songs that appear on the EP. “Eyes In The Eyes” begins with “Another Day” building intro: drums set the pace and rhythm, the guitars come in a little later with powerful chugging, while keyboards softly linger in the back. All this leads to a massive eruption of blastbeats, screaming guitars… a whirlwind of Melodic Death Metal preparing the way for the pounding verses. Naturally, there must be harsh vocals. The atmospheric backing (keyboards) allow for a little countering of the onslaught delivered by the guitars and drums. The contrast with the chorus couldn’t be bigger: a huge drop in tempo and aggressiveness, in favour of melody, emotion… and clean vocals. The growls take over in the second instant, but still… It’s been done before, but here the difference stands out like a lit candle in a dark room. The solo is pretty raw, while the backing is of the furious kind. The solo is pretty raw, with furious backing. Returning to the chorus could have been smoother. Now, I must admit, it sounds almost like pieces from two different songs were pasted together. However, there’s a nice groovy twist over halfway: drums and especially the bass being the center of attention. The guitars join in as the rhythm section continues it dance, so to speak. Keyboards feel like participating as well, albeit very faintly. The title track is next: monstrous guitar sounds creating tension. Afterwards the beast is unleashed: blasting Metal, raging guitars, and again the atmospheric backing. The verses are aggressive and pretty fast. However, the drumming is varied, be it pounding, blasting or playing Thrashy beats. The keyboards occasionally come through with accents, but operate mainly from the back. The mix doesn’t allows for a little more input, as the focus lies on the guitars and drums. So, in that context, the keyboards can’t offer enough to counter that wall. The solo is ok, but I’d say sloppier than before. The pace in the chorus is high, compared to “Another Day”. All ends with dual leadwork. This song contains good ideas, but on a whole it could be better. Last but not least, “The History Pages”. This one starts and builds in a way that reminded me a little of BEHEMOTH. Here no fast breakout, but carrying on like the song started. Compared to the other two songs, this one is darker, gloomier and more atmospheric. But again the bass is high in the mix, and the keyboards continue to operate from the back, especially in the chorus. The result sounds a bit like DARK TRANQUILLITY, INSOMNIUM, … A small guitar solo serves to reconnect with the verses, but it’s sounds rather sloppy. The music is also simpler than before, although there’s a catchy touch to it. When the intro theme returns, things transcend into a frenzy, to take it into extremes. Now the keyboards do come to the front, and the bass remains master of the mix. Very much even! Little by little the tempo increases, the power grows and the keyboards continue to push through the barrier. All this leads to a melodic Death/Black Metal-ish piece that paves the way for the solo parts, split in two by the chorus. All in all, not bad, again some good ideas, but especially the mix could have been better with regards to the alignment of the instruments. In the vast ocean of Melodic Death Metal, STORMHOLD is a very small fish that tries to find its place, but will have a hard time pushing through, I think. This EP is, generally speaking, alright for an in-between listening session. However, despite good ideas here and there, mainly the mix and not always tight guitar playing are aspects to work on. Hopefully the band will have these little problems solved when the full-length is due for release. But if you want to listen to some new material (comparable to e.g. CHILDREN OF BODOM, DARK TRANQUILLITY, KALMAH, etc…), then STORMHOLD can perhaps satisfy your needs.